Conversion of all faculty systems from paper-format to electronic format which allowed all students, staff easy access to e-learning materials among other services. Attracting numbers of students to work in Agriculture Sectors. As a result, the Faculty received double numbers of students this year. Other RUFORUM member universities that made it among the top 250 universities worldwide in the category of ‘Agriculture-Forestry’ include Stellenbosch University, University of Cape Town, University of Pretoria, and University of Kwazulu Natal. Prof. Hany A. El-Shemy received his two Ph.D. degrees in Biochemistry and Genetic Engineering from the University of Cairo, Egypt and University of Hiroshima, Japan. He became an Assistant Professor within the Biochemistry Department of Cairo University, Egypt from Sept, 1996, and advanced to Associate Professor in Sept, 2002, as well as full Professor in March 2007. His research interests are in the fields of plant biotechnology and medicinal plants (Molecular Biology). He received 2 patents, wrote 11 international books, published more than 85 scientific journal articles, and made 45 conference presentations. He also served as the technical committee member as well as chair of many international journals including being an editor of several journals including PLoS ONE journal, BMC Genomics, and Current Issue in Molecular Biology. He is also a reviewer for more than 25 scientific peer-reviewed journals. He received several awards, including State prize awarded from Academy of Science, Egypt (2004), Young Arab Researcher Prize awarded from Shuman Foundation, Jordan (2005), State Excellence prize from Academy of Science, Egypt (2011), Cairo University Prizes 2007, 2010, 2014. He served as an expert for African Regional Center of Technology, Dakar, Senegal. 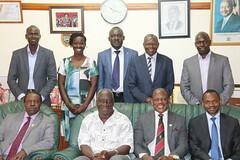 He is a visiting professor at Pan African University, African Union, Nairobi, Kenya. He was appointed acting vice president of the Academy of Science and Technology from 2013 to 2014, Egypt. Since 2014, he is working as a Dean of Faculty of Agriculture, Cairo University and Minister Advisor for African Affairs, Ministry of Higher Education and Scientific Research, EGYPT.